Spoken not by Henry V, but by a boy at what became a lengthy siege of the French channel port town of Harfleur. Henry had promised all his troops fame to follow their anticipated successful re-conquest of ancestral lands in France. The preliminary siege tied the English/Welsh army for much longer than expected and undermined Henry V’s original plans to march south and regain former English possessions in Aquitaine (English Gascony). Delayed in eventually taking Harfleur, the Battle of Agincourt was in fact a showdown as the English army instead made for its garrison at the Channel port of Calais and home! Boar's head inn keeping with that pictured Ringwood (New Forest) ale! 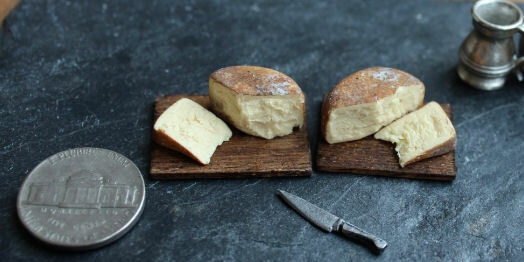 12th scale dollshouse cheese by MedievalMorsels with your ale anyone? Henry V of course would never have been seen in an alehouse, but he would have drunk ale however as all classes of society did. He and the nobility would also have enjoyed imported Gascon wine from ancestral English possessions in France! 12th scale ale and lampreys by MedievalMorsels anyone? 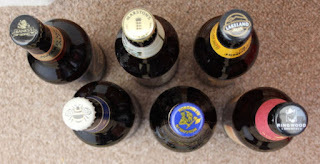 But returning to ale and beer, there is a lot of confusion about them. Are they the same thing? And if they are different, what is that difference and which came first? To make ale or beer you need water, grain - in Britain this was barley - and yeast. Additionally, to make beer you need hops. "Beer" was the name for fermented malt liquors bittered with hops. Barley was an extremely important cereal across northern Europe in Dark and Middle Ages. It was a staple food of man and beast alike. It was fermented barley, known as malt, that was the essential basis of brewing ale. Home brewed ale was drunk by all classes of medieval society, including their children who would probably have been given a weaker version! Because water is boiled as part of the process, ale was a safer drink than water itself. 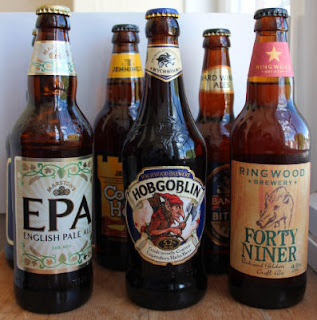 Its alcoholic content would also discourage micro-organisms to some extent, although ale did rapidly go sour. The cloudy drink was nutritious too! Ale made with a top fermenting yeast continued to be the drink of choice, even in Shakespeare's day. Everyone from the poorest farmer to the Queen herself drank the brew, and a mini brewery was an essential part of every aspiring merchant class, and noble household. Shakespeare's own father was an official ale taster in Stratford – an important and respected job which involved monitoring the ingredients used by professional brewers and ensuring they sold their ale at Crown-regulated prices. Tudor society, and Medieval society before it, was highly regulated you see! So we know ale drinking habits continued throughout England into Elizabethan times when, from 1524, the introduction of hops and beer making began to gain some ground in London. This was despite hopped beer first being imported from Holland much earlier, around 1400. And despite hops being condemned as late as 1519 as a "wicked and pernicious weed". Hops are useful in helping to preserve beer, and this likely became a reason for man first using them about 1400 years ago. Their first known use was in Germany in the 8th century. Hops used in England were imported from France, Holland and Germany with import duty to pay! It was not until 1524 that hops were first grown in Kent in the southeast of England, introduced as an agricultural crop by Dutch farmers. But what are hops? The hops used in brewing are actually the flowers of the hop plant, a vine-like climbing member of the hemp family. 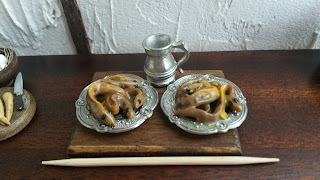 They contain an essential oil with a very bitter flavour which counters the sweetness from the malt, to create a more balanced beer. As we have learned, hops also act as a preservative. According to Anne Wilson’s book “Food and Drink in Britain” by Elizabeth I's reign (1558 - 1603) even ale came to be lightly hopped to help it keep better. Annette Hope in her book “Londoners’ Larder notes that both ale and beer could be made very strong “..and London ale houses, where the ‘ale-knights’ sat all day, drinking until they fell off their stools, were a byword.” A few dents to their armour then! And a byword for excess by the sound of it! Hopped beer, with its better keeping properties eventually became more popular than ale. 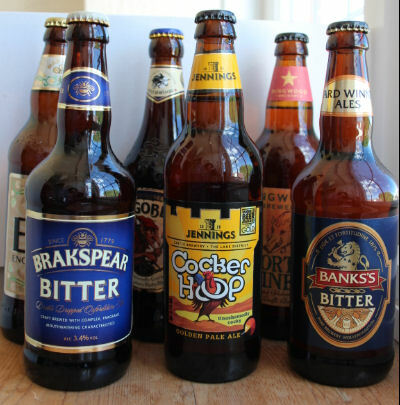 In 1574, there were still 58 ale brewers to 33 beer brewers in the City (London), but beer gradually replaced ale as the national drink over the course of the century. Alehouses were rough and ready. Taverns by contrast served a better class of person with wine and simple food.